San Cipriano, Lovely Cottage with Nice Views in Beautiful Surroundings. 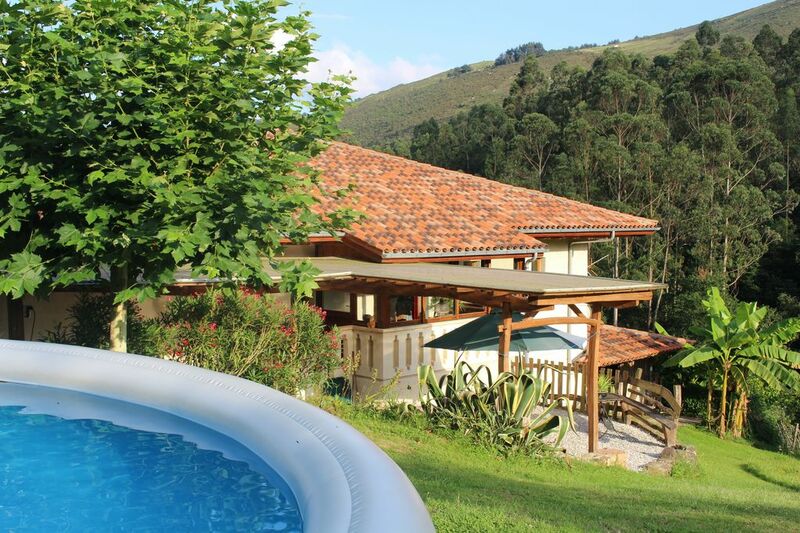 Cottage in Cartes, Cantabria, Spain - Peaceful Location, Between the Mountains and the Atlantic Ocean. San Cipriano is a complete and individual apartment in a charming country house. The San Cipriano cottage has it´s own access and fenced grounds. The house is completely private, set on its own very large plot of over 7 acres of land with a small stream and enjoys lovely views. The property is ideally located to explore the breathtaking natural beauty of the Northern coast of Spain. This house provides an increasingly rare opportunity to experience unspoilt rural Spain. It is ideal for the independent-minded traveller who enjoys the natural world and is looking for something a little bit different. Originally we are from Holland. My husband and I fell in love with this beautifull region of northern Spain and decided to live there permantly. We purchased the property in 2001 and we are very hapy here with our 2 children who had 1 and 3 years of age when we went to Spain. We live within the property, at the other side of the house. We´re always happy to offer help and advice during your stay, whilst at the same time, respecting your privacy. We hope you will enjoy Cantabria just as much as we do. toilet, shower, bidet, Separate toilet with bidet. Bathroom with shower, separate toilet and integrated shower-bidet. Bath towels included. Comfortable and cozy living-dining room with tv and dvd, en-suite veranda with lovely views. Well equipped kitchenette, including four ring ceramic hob, microwave, toaster, coffee machine, kettle, fridge with small freezer, washing machine. All the necessary kitchen utensils are provided. Nearest skiing: Alto Campoo Ski Resort. Alto Campóo lies within three mountains; Cuchillon, El Chivo and Tres Mares. There are 19km of skiing and snowboarding runs in the ski area. The resort is an excellently equipped ski resort that sits on the top of a mountain range whose peaks are over 2000m high, Los Picos de Europa. The resort offers magnificent facilities for skiing for families in the midst of a stunning setting. Here you will see some of the best views in all of Spain. In summer the Picos de Europa mountains are a paradise for walking and climbing with magnificent flora and fauna. There are several excellent Golf Courses within 30-45 minutes drive. Nearest golf: campo de golf, Abra del Pas, Miengo, 25km thanks to Cantabria’s climate, the golf courses are well-watered and well-kept. Probably the best of them is the Real Club de golf de Pedreña, with its position overlooking the bay of Santander, making it one of Spain's finest. San Vicente de la Barquera has the Santa Marina golf course wich is surrounded by woods and creeks. It is one of the last courses designed by the spaniard Severiano Ballesteros (18 holes) and situated in the privileged Natural Park of Oyambre. Notes on accommodation: Warm and inviting apartment, in a charming rustic country house set in a truly picturesque location offering fantastic views over the rural countryside and mountains, peace and tranquility. Private pool for guests available from may to september. The cottage is attached to the main house but accessed independently and completely private. To guarantee our guests comfort, there is a max. of 4 sleeps. Free WiFi. This is a non-smoking cottage. Pets are welcome but please check with the owner before bringing. Outside: Easy to access, parking on your doorstep, the use of a car is recommended. Very nice veranda/porch en suite, windows all around that can be completely opened. Terracy, table with four chairs, barbecue, badminton table and swimming pool. The porch and terrace are very pleasant areas, surrounded by farmland, forests and with mountain views. Sit there and feel yourself surrounded by nature in this gorgeous landscape of green rolling hills. Cleaning / Towels / Linen / Maid service: All bed linen and towels are provided. Other: Veranda en-suite, with dining-table, windows all around, can be completely opened to enjoy the views. Fantastic location for Cantabria and Asturias's national parks, coast and mountains. Well equipped cosy, comfortable holiday let with stunning views. Tucked away in a peaceful, secluded valley surrounded by beautiful countryside but close enough to local amenities for food shopping and Autovia for sightseeing and daytrips. A private wing of their beautiful homestead complete with sheep and chickens, Judith and Martin couldn't do enough to make us feel comfortable. Thanks for the Lego for our four year old. Great for kids ( big field to run around in and pool (in season) Very memorable and happy family stay. Pros: amazing rural setting, complete with cows, sheep, donkeys and chickens. The owner was efficient and responsive throughout. She very kindly made a phone call for us as our Spanish was not good enough. A good center from which to see many wonderful sites. Small but adequate kitchen, ditto bathroom. Comfortable beds. Cons: very steep, narrow stairs to bedrooms - would not be suitable for anyone with mobility issues. The rental shares paper-thin walls with the owners and another rental unit - which meant that we were at the mercy of their schedules and habits, although this was apparently not an issue for previous reviewers. Thank you for your review and for highlighting some features of the cottage you liked less. I apologize for the noises from my other rental that you experienced. Although there are no thin walls in the building, your stay coincided with a family with an extremely vocal little child, sometimes crying at night or very early in the morning. I completely understand how this must have bothered you. I am really sorry and I will do my very best to avoid this from happening in the future. It is clearly stated on the website that this rental is not suitable for people with reduced mobility. A photograph of the stairs that leads to the bedrooms is displayed in the gallery. It is indeed quite steep, although not too wide, with handrails on both sides for good gripp, and well illuminated. Thanks again for your feedback, I was very nice having you as my guests. Comfortable villa with beautiful views of the mountains around. Eagles flying overhead, yet still quick to get into Torrelavega for supermarkets etc. and less than 30 minutes to beautiful sandy beaches (Oyambre was our favourite). Good for surfing, hiking and cycling (if you like cycling on very hilly roads!). Great welcoming hosts, always there if you need them but not intrusive. The villa sits within several acres of land with a few sheep and horses around to keep the grass down - the kids loved feeding them. There's even some woods accessible just across the lower field if you want to explore further. Bar/Restaurant: ´Mesón San Cipriano´ at 500 meters, walking distance. Traditional spanish cuisine, tapas. This is also the point from where the beautiful walks into the Ibio moutain range start. The Peaks of Europe with it´s snow clad peaks, beautiful forests, abundant wild flowers and tumbling waterfalls make this a naturalist's paradise. The Picos is home to over 70 mammal species including lynx, wolves and bears. It is ideal for bird-watchers with over 176 bird species including hawks, kites and eagles and 155 species of butterfly. Many gorgeous sandy beaches to enjoy, for example La Concha´de Suances at 25 min. drive, a shell formed beach ideal for swimming and sun bathing. Another Suances beach is Los Locos, more natural and famous for it's big waves, ideal for surfers. There is also the natural park of Liencres, a beautiful dune reserve with stunning beaches and pine tree woods, for long walks on the beach. Cars can be hired at Bilbao or Santander airports or you can bring your own car on the ferries from Portsmouth or Plymouth. The house is located in a quiet and natural surrounding, at 1km from the village of San Miguel de Cohicillos. The town Cartes, at 5km, is worth visiting for it´s beautiful medieval ´Camino Real´ connecting it to the even so beautifully village of Riocorvo. Santillana del Mar is at 15 min. Colourful fishing villages as Comillas, San Vicente de la Barquera at 25 min. Santander at 30min. Potes and ´Los Picos de Europa´ and Bilbao and he Guggenheim museum at one hours drive. Close to Cabárceno. A delightful rustic cottage set in the foothills of the Ibio mountain range but only 20 minutes from the Atlantic beaches. Ideal for those who just want to escape to an idyllic location and relax or those who are looking for adventure. The northern Spanish province of Cantabria forms a large part of the area known as Green Spain, a region far removed from the frenetic activity of Spain's southern resorts. It is easy to imagine that you are in an entirely different country. This is a traditional, still largely undiscovered Spain where countryside and coast combine to reward visitors with a truly unforgettable experience. To wander the network of cobbled streets of medieval towns like Santillana del Mar or Potes has often been likened to entering a living museum. There's absolutely no doubt that Santillana is one of the most perfectly preserved medieval villages anywhere in Spain. All around us you'll find some of the most spectacularly beautiful countryside imaginable. All along the Cantabrian coastline you'll also discover any number of gorgeous sandy beaches blissfully free of crowds. The property is ideally located to explore the breathtaking natural beauty of the Northern coast of Spain. If you like fish and seafood then San Vicente de la Barquera is the place for you. A lovely small fishing town with a castle on a hill, and a really long sandy beach. Loads of great fish restaurants. The proximity to the coast influences many aspects of life from the painted fishing boats in San Vicente and Llanes harbour to the range of local seafood available in restaurants and local shops. But you can also escape to the mountains, losing yourself on twisting mountain roads and discovering tiny remote village.